As a long-time Disney devotee (the early movies, anyway), it is not surprising that my initial perception of London was pretty heavily influenced by such classics as Mary Poppins and Peter Pan. And, since Big Ben plays a prominent role in the opening scenes of both of those movies, it stands to reason that the illustrious clock tower would be at the top of my London landmarks bucket list! Big Ben, as you may know, is actually the name of the bell within the tower and—here is a little-known trivia fact for you—that isn’t even its official name! Big Ben’s moniker (talking about the bell itself) is The Great Bell. The tower that is usually referred to as Big Ben is actually called the Elizabeth Tower. Formerly referred to simply as the Clock Tower, it was renamed in 2012 to honor Queen Elizabeth II on the occasion of her Diamond Jubilee (sixty years on the throne). 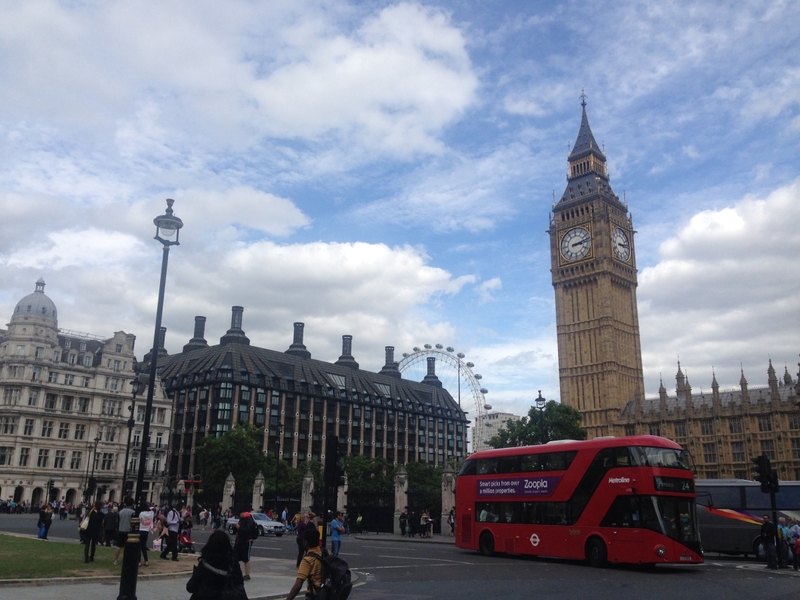 For ease of reference, in this post I will refer to the tower and its clock as Big Ben. Situated at the north end of the Palace of Westminster in London, Big Ben chimes every fifteen minutes. It is likely the most recognizable landmark in London and quite possibly the most photographed. Sadly, overseas visitors cannot tour Big Ben, and residents of the UK must contact their local MP or a Member of the House of Lords to arrange for a visit. After climbing to the top of the Leaning Tower of Pisa, the Duomo in Florence, and St. Paul’s Cathedral, I was pretty bummed not to get to climb to the top of the tower. But, I did get to hear the chimes and I managed to get a photo in a phone booth with Big Ben in the background…sort of. All in all, I was pumped to actually see the famous fellow! Each dial is seven meters (just short of twenty-three feet) in diameter. The minute hands are 4.2 meters (13′ 9″) long and weigh about 100kg (about 220 lbs. ), including counterweights. The numbers are approximately 60cm (just short of two feet) long. There are 312 pieces of glass in each clock dial. A special light above the clock’s faces is illuminated when parliament is in session. Big Ben’s timekeeping is strictly regulated by a stack of coins placed on the huge pendulum. Big Ben has rarely stopped. Even after a bomb destroyed the Commons chamber during the Second World War, the clock tower survived and Big Ben continued to strike the hours. The chimes of Big Ben were first broadcast by the BBC on 31 December 1923, a tradition that continues to this day.